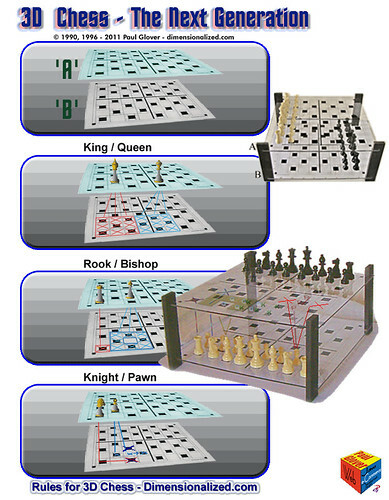 I have personally found, that after playing many games of 3D Chess (Chess – The Next Generation), the best way to set up the board for just one game (as a-pose-to playing 3 games with the same person), would be to set the game up as seen in the picture below. This is also the better set up as it prevents a corner attack early in the game. Also, I found that the person who is just starting out in 3D chess, he should set up his pieces on the bottom board which forces him to look through the top board. In this way he is always aware of another board for his pieces to move to. This will allow him the full enjoyment of this dimensional game. 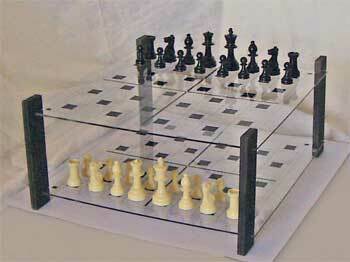 I am the inventor of this 3D Chess Game (with copyright from Washington DC) and I’m all about making the game work with out a flaw. Everyone knows that even if there is just a slight flaw or a loop-hole to the game, it is suddenly no fun and the game stops being played. This is still “Chess”. It just has another board and it helps you to think outside the box. You won’t know how fun it is until you try it for your self (It takes a couple of games). Of course it should be noted that WHITE could be on top because that would be determined by the one who is playing white (then of course, BLACK would be on the bottom board). It could also be decided upon ahead of time, that this is the way to set-up the game for a tournament.